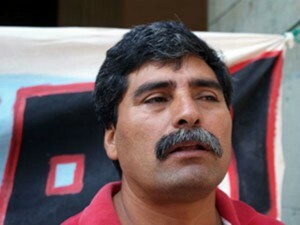 During the morning of 16 October in Oaxaca de Juárez, Juan Sosa Maldonado, representative of the Organization of Indigenous Zapotec Peoples (OPIZ), suffered an assassination attempt which left him uninjured. The attempt took place as he was traveling with his family in a car, when a motorcyclist opened fired on the automobile, with none of the three gunshots hitting any of the occupants of the moving vehicle. Juan Sosa Maldonado, a former political prisoner, was detained and tortured by the Judicial State Police in 1998, accused of having pertaining to the Popular Revolutionary Army (EPR). The activist has been acting to defend prisoners from the Loxicha region who have been accused of pertaining to the EPR and have spent 17 years imprisoned for that reason. He has moreover denounced the forced disappearances and extrajudicial executions which have taken place in Oaxaca. It is for these reasons that Sosa Maldonado motivated this latest attack on his person and that of his family. The Defense Agency for the Human Rights of the People of the Oaxaca has released precautionary measures for the protection of the OPIZ representative and his family.